Who’s up for a little boost of energy? Things are heating up here in NYC and I can’t help but miss my summers down in Brazil. Me and a group of friends used to drive down to my grandparents beach house (that we had for ourselves) every weekend in January/February. We would spend all day on the beach and do things young people do… Which is pretty much drink a lot and party until sunrise. Usually young people do those things and then survive on pizza and frozen food. However, this specific group had me as a hostess, so – ahem – they ate very well. That doesn’t mean we wouldn’t get the traditional acai bowl at the beach. Oh no! Those were sacred. We didn’t get them for breakfast, as breakfast time was long gone when we woke up, but as an afternoon snack after swimming or sun tanning to replenish our energy and prepare our bodies for another night of heavy partying. 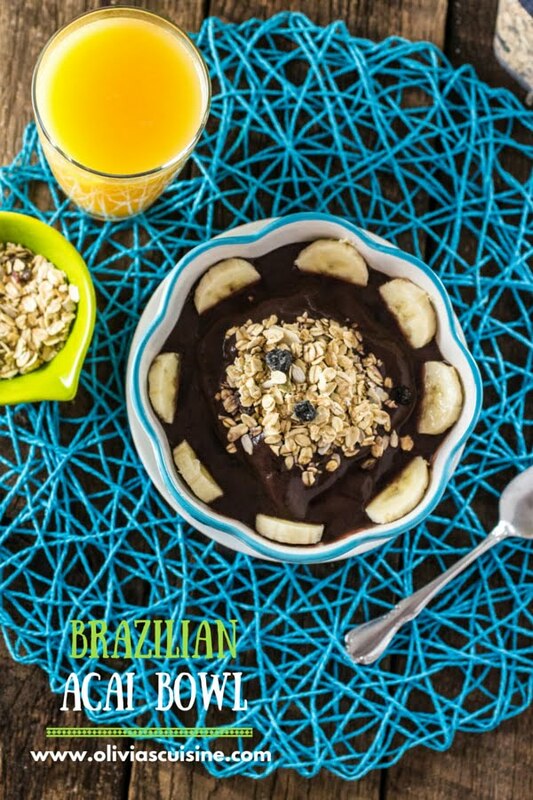 Acai bowls are also very popular as a pre or post-work out meal down in Brazil. The whole trend around this “superfruit” began with the surfers and expanded to the big cities. My hometown, São Paulo, has a few bars that are exclusively for “acai”. Hundreds of varieties, with different fruits, different types of granola, with or without Guaraná for even more energy, etc… These places are usually packed during late afternoon, almost as if the “healthy freaks” consider their acai bowls a happy hour treat of some sorts. As you know, acai has been known for boosting energy, because of its anti-oxidant properties, which also promotes faster recovery times and increases stamina. However, this little fruit also boosts heart health, contains anti-aging properties (because of its good fatty acids) and advances weight loss. 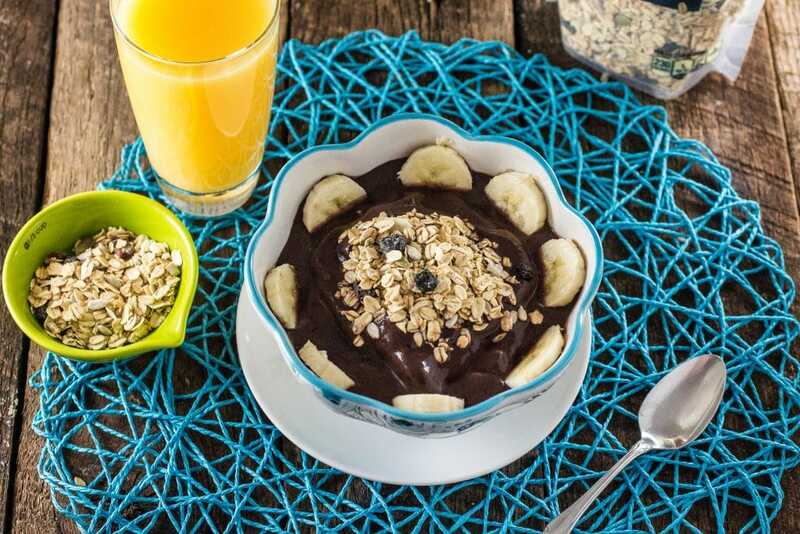 On top of that, it is packed with protein (the amino content found within acai berries is almost the equivalent of an egg), hence why it is so popular among athletic folks. When Nature Valley sent me some of their new Nature ValleyTM Toasted Oats Muesli (both the Blueberry and the Original) version, I knew I had to use it as a topping to my Acai Bowl. I mean, don’t get me wrong, their muesli is so good that I’ve been eating it everyday, either with milk or yogurt. 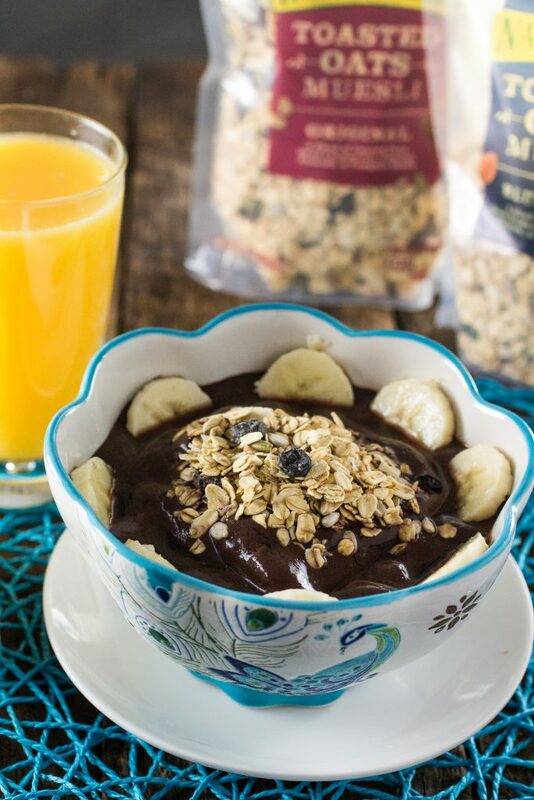 However, it is the most perfect topping for a delicious acai bowl as it adds this amazing crunch that makes all the difference in the world and its a healthier version of granola. Don’t you love it when you find a product you like that also makes everything so much simpler and quicker? I’ve been trying to get my husband to eat breakfast at home, so he stops spending our hard-earned money at the bagel guy in front of his office. But for that to work it needs to be something that he can eat quick or have it to go. Nature Valley Muesli has been the perfect solution for this problem as there is so many ways to eat it, hot or cold. The muesli is a delicious blend of whole rolled oats, fruit, nuts, and seeds. It is lightly sweetened and made with wholesome ingredients you can feel good about eating. They started stocking major retailers and grocers on June 1st, so you shouldn’t have any problems finding it now. Also, to encourage you to try it, the awesome peeps at Nature Valley are giving my readers a $1 off coupon that you can find here! I love the versatility of this dish. You can pretty much customize with your favorite fruits/cereal, thicken with avocado or peanut butter, and even add more liquid and make a smoothie. It is pretty easy to make too. The blender pretty much does all the work for you and all that’s left to do is slice some fresh fruit to top your bowl. Sometimes getting the right consistency can be a little tricky. You want your acai bowl to be creamy, almost like ice cream consistency, so I suggest you only add the liquid if necessary, after you purée the acai frozen pack with the banana. For most people, the sweetness of the banana is enough. However, if you like some extra sweetness, you could add some agave syrup, honey or the traditional Guaraná syrup (that also pumps the energy level up quite a bit!). If you’re bold and don’t mind the sugar, you could even use sweet condensed milk for a more decadent version! I like to keep my Açaí bowl on the healthy side, though. My favorite fixings are a sliced banana and some muesli! Sometimes I substitute the banana for strawberries. Sometimes I do both. And sometimes I add some shaved coconut and some nuts! It all comes down to what I have available in my pantry/fridge. So what about you? 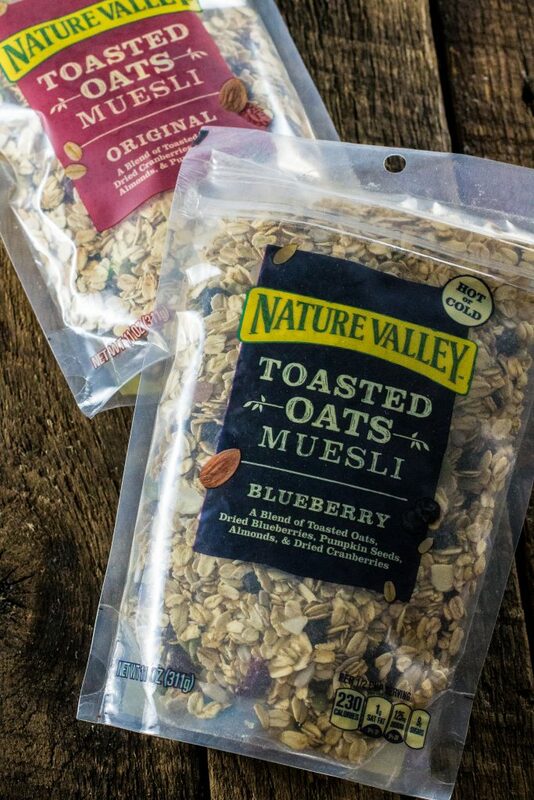 What would be your favorite way of eating Nature Valley’s Muesli? A quick and easy vegan breakfast that will provide you with the energy for a busy day! Run the acai smoothie packs under water for 5 seconds. Blend the acai puree, the banana and the agave nectar (if using) until smooth and thick. If you think it's too thick, add some juice (or milk) to loosen it up. Girl, it sounds like you had some good times at the beach! I wish I had one of these Acai Bowls right now because I could sure use an energy burst! It looks delicious too! My family loves Acaii!!! The muesli sounds like a great topping! Thanks, Renee! It is a great topping and so good for you! We all enjoy Acaii! this really looks good. What a delicious looking bowl Olivia! love the museli topping! Thanks, Manali! The muesli is so delicious. You have to try it! ok this bowl looks totally delicious, I would love to eat something so refreshing and flavorful all summer long for breakfast. But now all food aside, can you please tell me where did you get that beautiful blur prop?? not sure what it is but I am obsessed! I want to incorporate acai into my diet and didn’t realize it come in these frozen acai puree. I’ll have to look for it at the stores. This dish sounds delicious and I love that it is super healthy. Yes, just go to the frozen section of your local grocery store. If they don’t have it, try one of those healthy store, like Whole Foods! I love all your Brazilian recipes, Olivia! 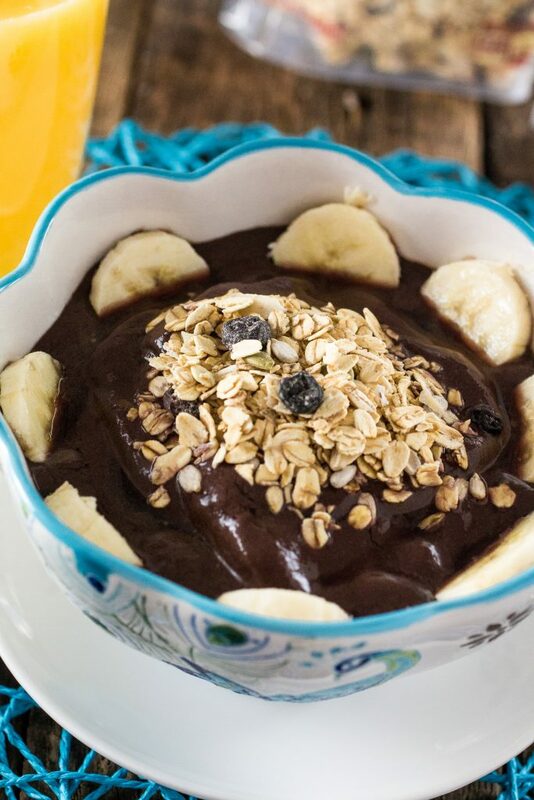 This acai bowl looks perfect healthy breakfast to me! thanks for sharing! Thanks, Savita! Funny how I used to hate acai when I was little. I thought it tasted like “soil”. Good thing now I love it, cause it’s so healthy and a great source of energy!